Most elderly respondents (68.5%) said breaking up of the joint family system is one of the biggest factors for the challenges they face in getting long-term, palliative care. Older people in India often face problems such as disability, restricted mobility, loneliness, poverty and lack of awareness on accessing old-term care. With a fast growing population of older people, the ever-increasing gap between generations and the fast and demanding lifestyle of young people, for a majority of older people, life is still a struggle for independence. “According to 64% of elderly respondents, loneliness, marginalization, and isolation are the most critical issues faced by bedridden, elderly patients as they cannot visit, meet or interact with their relatives, friends and neighbours," said Himanshu Rath, founder of Agewell Foundation. The elderly have to compromise and make adjustments in their lifestyle according to the wishes of the younger members of their families to ensure they are cared for, the study revealed. It highlighted that 67.6% of the elderly being taken care of their family members have to look after the children of the families. They have to perform tasks such as babysitting in return for proper care and support. 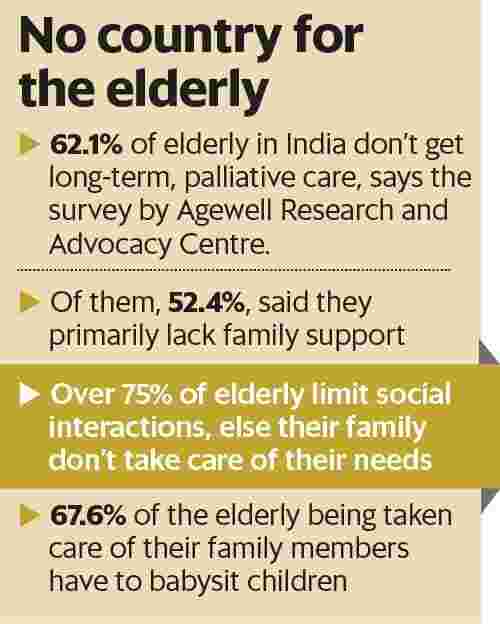 “Around 73.7% said they have to take care of the house and other properties of their younger family members to ensure long-term and palliative care in old age," the study report said. “Over 75% of respondents have to limit their personal social interactions as their family members direct them to do so, otherwise their family members can avoid providing their basic needs of food and medicines." Healthcare equipment such as wheelchairs, relief material such as adult diapers and care-giving service should be provided on a regular basis to destitute older people, who are bedridden and suffering from acute mobility issues, the report said. “Though providing long-term and palliative care to older persons comes in the purview of family responsibilities in India, it is observed that older persons, who are financially independent, have a high net worth or hold property entitlements, are treated comparatively well by their family members" said Rath. “Managing home care for the elderly is a massive challenge as multiple service providers—nursing agencies, physiotherapists and medical suppliers—are small scale and unorganized and, therefore, provide incomplete care," he said. “In India, health insurance coverage is essentially limited to hospitalization. The concept of geriatric care has remained a neglected area of medicine so far in the country."